Reliance Jio is offering data worth Rs. 1,999 and unlimited voice calls for free to new customers who buy its WiFi router, JioFi. JioFi allows multiple users and mobile devices to connect to Jio's 4G internet service. Reliance Jio in its latest offer is selling its wifi router, JioFi, "effectively at zero cost", the company said in a post on micro-blogging site Twitter. It is offering data worth Rs. 1,999 and unlimited voice calls for free to new customers who buy its WiFi router, JioFi, by paying Rs 1,999, making the device effectively free of cost. 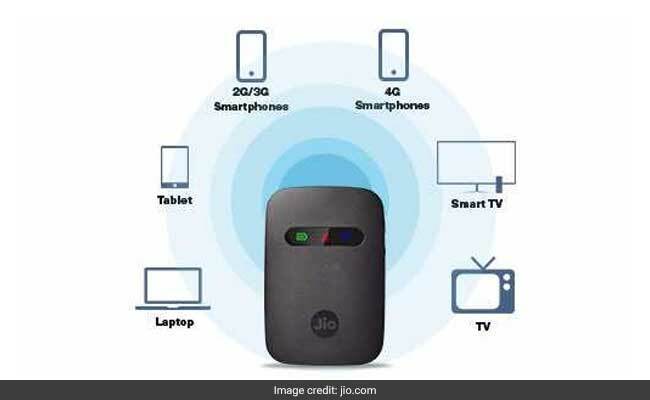 The JioFi allows multiple users and mobile devices (including 2G/3G smartphones, laptops and tablets) to connect to Jio's 4G internet service and create a personal WiFi hotspot, according to the company's website. Under this offer, you have four options to get the free data worth Rs. 1,999. To avail the offer, a customer needs to buy a JioFi device by paying Rs. 1,999 and subscribe to Jio services by obtaining a Jio SIM card either through the Jio stores, trade partners or from Jio website. After you buy a JioFi device by paying Rs. 1,999, get a new SIM from the Jio Store by submitting you KYC proof like Aadhaar card and get Jio Prime Plan activated. You don't have to pay anything extra for the Prime membership. After Prime Plan gets activated, you have to choose one data plan from four available options below. Insert the newly activated SIM inside the JioFi device within 24hrs of SIM activation to start enjoying the offer benefits. Customers can also buy the JioFi device with monthly equated instalments starting as low as Rs. 95.03. Click here for details.